Removal of telephone poles along railroad rights-of-way in the West has been, for me at least, an unalloyed joy. No more is the perfect shot ruined by black wires between photographer and train. No more is pristine Western landscape fouled by poles that look like dead trees. However, the removal of poles serves a useful purpose only in areas with little or no foliage. 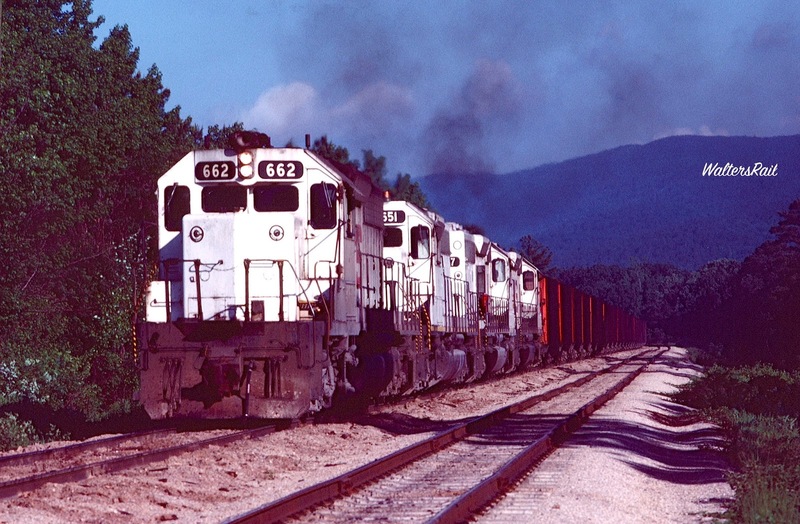 In heavily forested areas, the removal of telephone poles has allowed railroads to decrease the width of rights-of-way that must be kept clear. Consequently, lines through heavily forested mountains have seen the number of available shots decrease dramatically in the past twenty years, as trees have encroached on areas once kept clear for telephone lines. 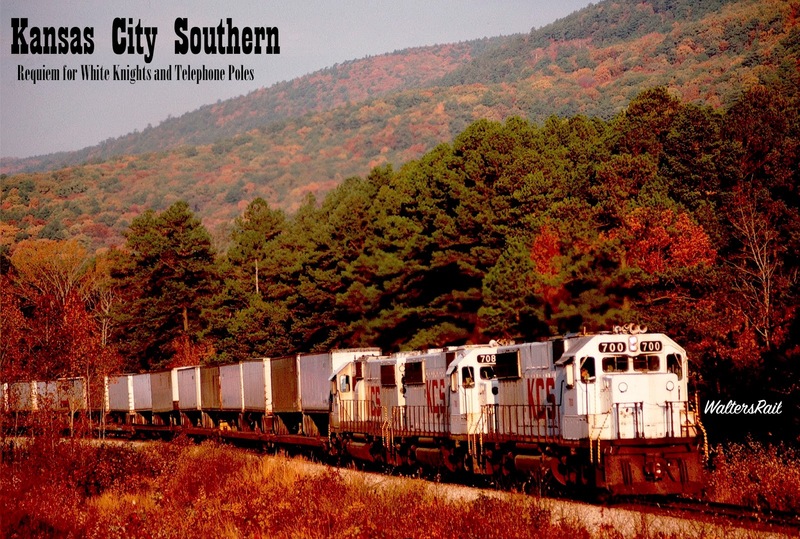 A case in point is the Kansas City Southern through southeast Oklahoma and southwest Arkansas. 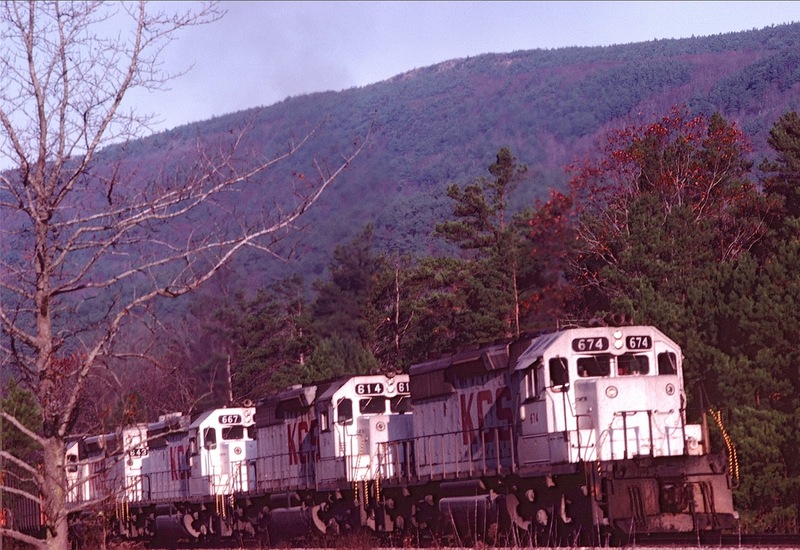 Thirty years ago, the line across Rich Mountain provided any number of good photo locations. In those days, one could chase a loaded coal train south out of Heavener, Oklahoma, and (were one so inclined) take images of the train in ten or more locations as it struggled into the grade at 15 miles per hour. Today, almost every one of those photo locations is overgrown with trees. As the telephone poles came out, the trees came in. The image immediately above demonstrates the point. 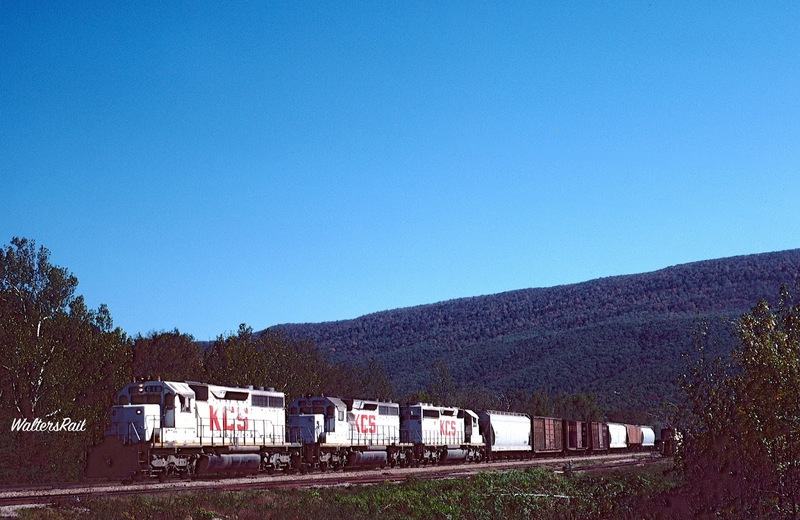 In 1982, the right-of-way beside the tracks was kept clear below the telephone lines, giving easy access to the coal train and the mountain ridge beyond. 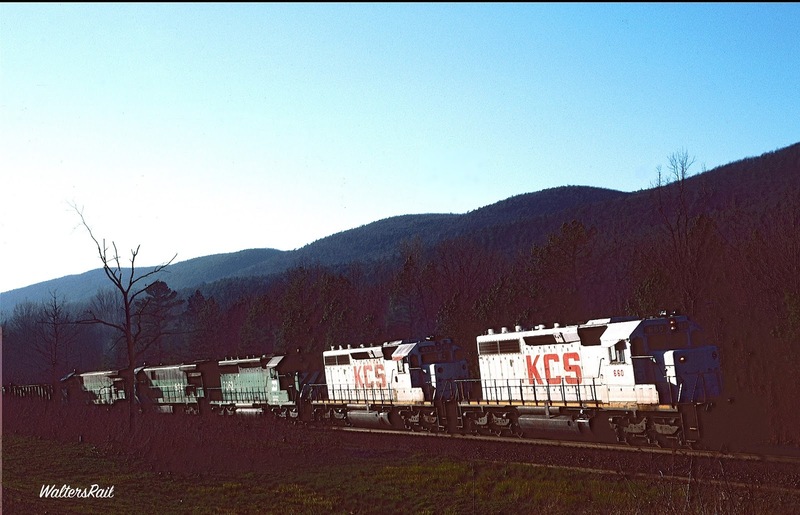 Once the poles came down, the KCS stopped clearing the right-of-way. Today (September 2016), both tracks and mountain are hidden behind new growth timber. 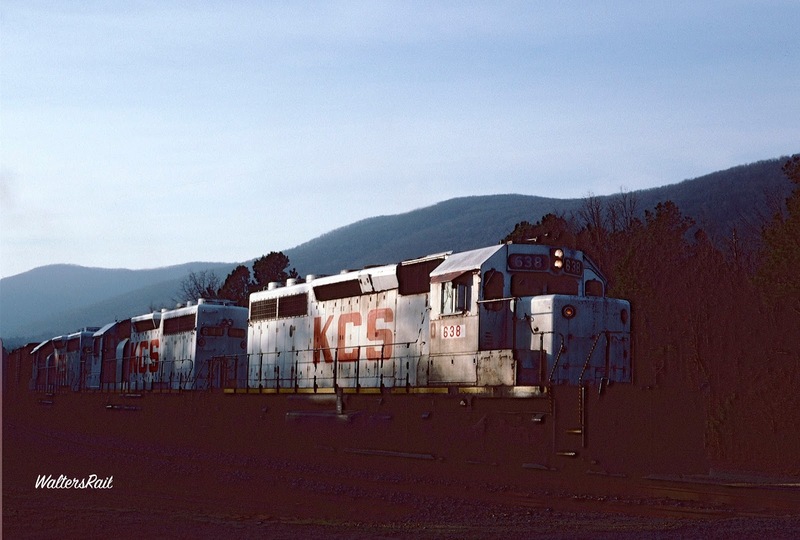 This loss of viewing space on the KCS was accompanied by the demise of the “White Knight” paint scheme – railroad engines painted solid white except for the red “KCS” on their flanks. Despite the arduous climb across Rich Mountain, the railroad kept the White Knights remarkably clean, in part because of the lack of tunnels on the mountain grade. This is my tribute to the loss of those two old friends: White Knights and Telephone Poles. 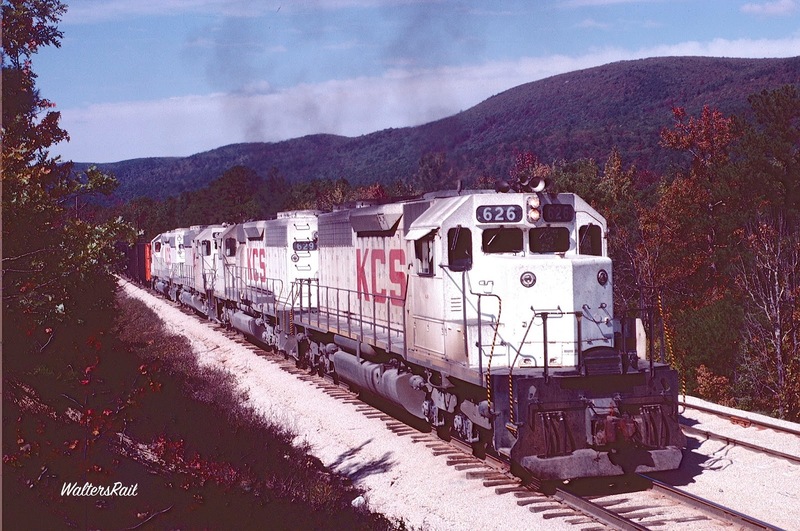 In 1972, the KCS was as sick as an old man who has smoked his entire life. Derailments were common and unremarked, occurring often when the trains reached what crews referred to as “rocking speed” – about 18 mph – when the locomotive and cars would begin swaying violently. 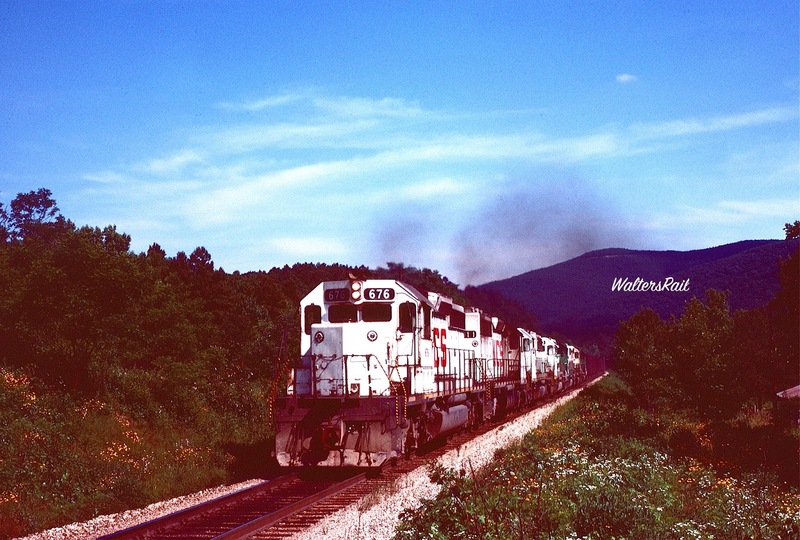 U.S. 59, paralleling the railroad from Heavener, Oklahoma, to Mena, Arkansas, was littered with air hoses, couplers, wheels, axles and boxcar carcasses. Management seemed obsessed with cost-cutting. 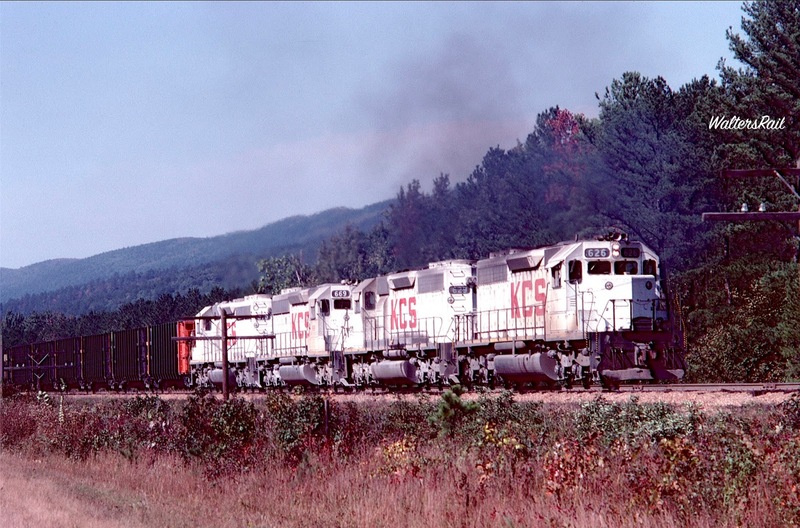 To reduce crews, the railroad often ran trains in excess of 200 cars – substantially longer than the few available passing sidings. A meet of two such trains, called a “saw-by,” was Byzantine and very difficult to describe. The power of the first train (headed north, we will assume) would enter the south end of the siding, its 200-plus cars rocking behind; traverse the siding’s entire length; emerge back on the main line at the north end of the siding and continue rolling until the caboose was safely past the south siding switch and off the mainline. Then this northbound train would be split so that as many cars as possible remained on the siding. Its front end power would then run backward (south) on the main line, pushing its remaining cars to the far (southern) end of the siding where it had originally entered, and then continue down the mainline far enough so that the southbound train could move forward (southward) until it had cleared that same southern end of the passing siding where the first train had originally entered. Next the southbound train would back north onto the siding, pushing the first train’s cars through the north end of the siding and onto the mainline. When the southbound train (now backing north!) 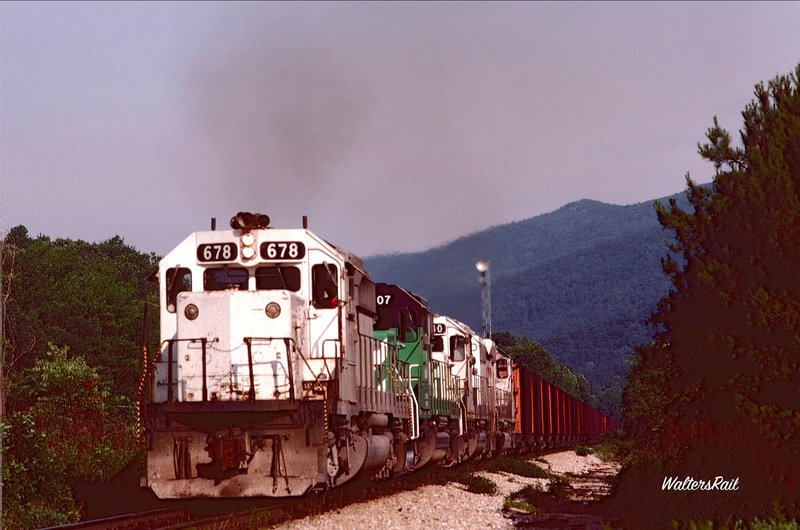 had itself moved completely through the siding’s north end and onto the mainline again, the front end power of the northbound train, along with its remaining cars, would then roll north and enter the siding’s south end until its cars were off the mainline. The southbound train would then move forward (south) on the mainline, pulling not only its own cars but also those cars of the northbound train originally separated and parked on the siding. When all the southbound train’s cars, including the extra cars from the northbound train, were clear of the south end of the passing siding, the front end power of the northbound train would then back south onto the mainline and couple onto its remaining cars. At this point, the cabooses of the two trains would be coupled back-to-back! Then, mercifully, the cabooses would be uncoupled; one train would roll north and the other would roll south. This procedure took one to two hours. Even though I saw it more than once, it still seems impossible. Next, the railroad began removing passing sidings. 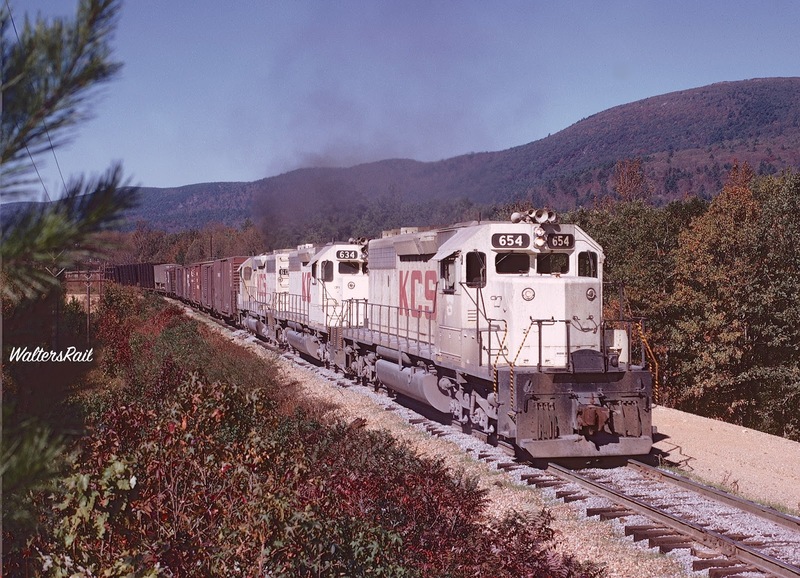 The Rich Mountain siding, one of two located in the Ouachita Mountains, disappeared, though the Page siding was spared. 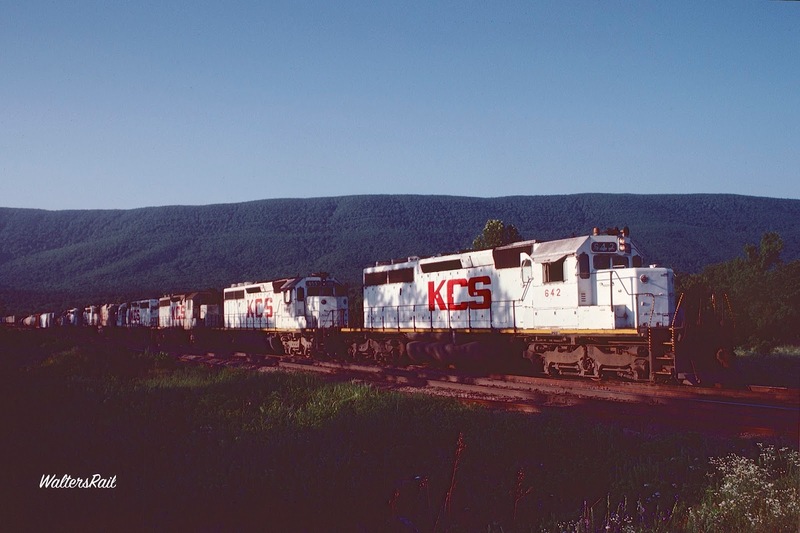 Images of the old Page siding, however, show just how decrepit the KCS had become. Here is Rich Mountain after removal of the passing siding. 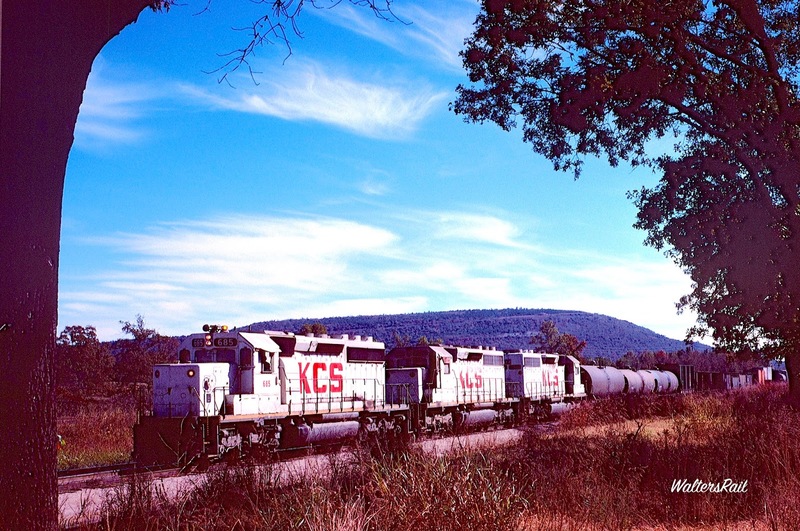 The KCS has added new ties and ballast in anticipation of increasing coal traffic. Since the removal of the poles and wires shown, the foliage has grown about 30 feet, and this image is no longer available. 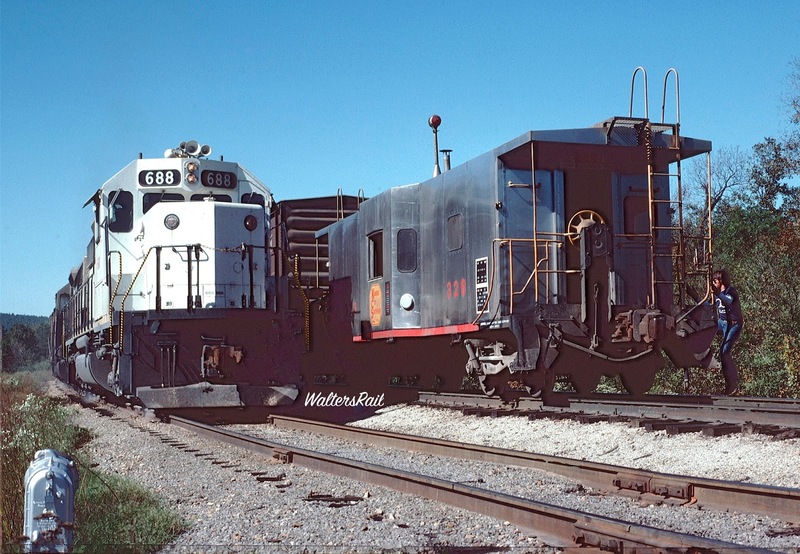 The railroad has also purchased new engines and painted them white. (The previous paint scheme was dark red.) 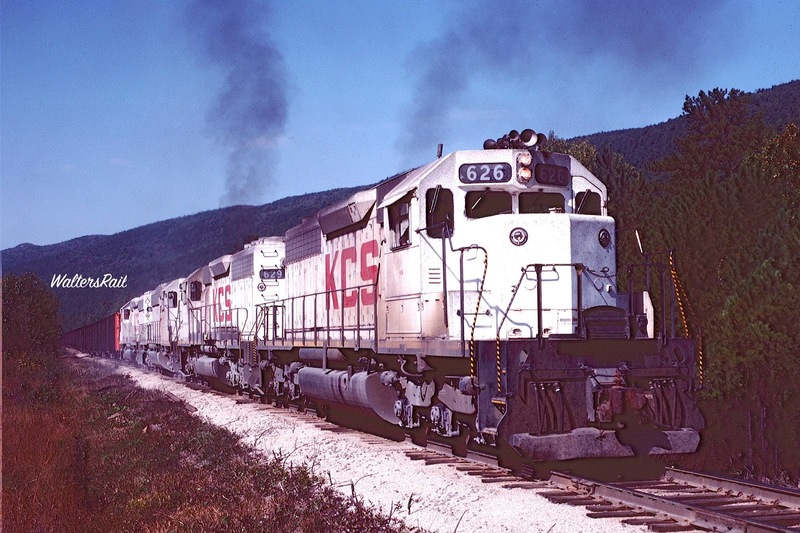 Shining white locomotives were a startling sight as they pulled long, rocking trains through the mixed pine and hardwood forests of Oklahoma and Arkansas. The mountains run east to west like parallel hedge rows. When one ridge is crossed, another takes its place, then another, then another, forming an almost impenetrable barrier to civilization. The first highway across the mountains was not completed until 1961. Prior to Oklahoma’s statehood, this area was part of the Choctaw Nation, created when the Choctaw were driven from their ancestral home in Mississippi – and completely off limits to federal jurisdiction. Isaac Parker, the “hanging judge” from Fort Smith, spent much of his time disposing of criminals brought back from the Ouachita Mountains by the Lighthorsemen, the Choctaw police force. Railroads avoided this area. The Frisco, the Kansas, Oklahoma and Gulf and the Katy south from Kansas City all swerved west to void the rugged terrain. 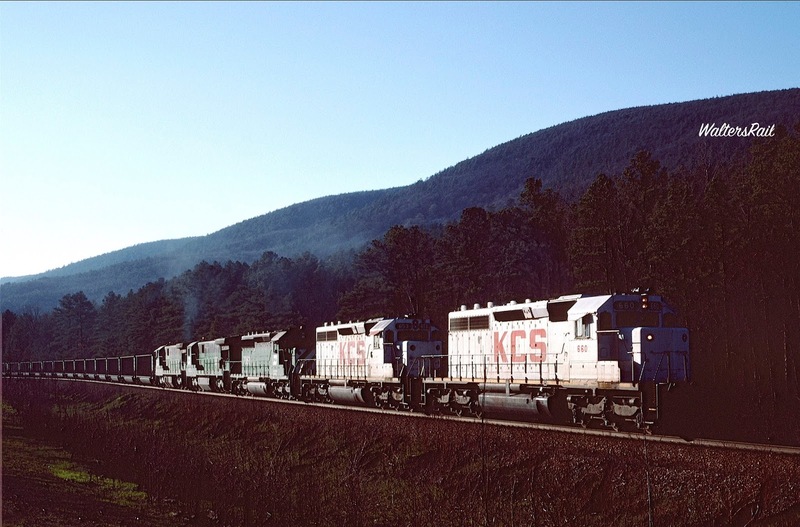 The last line constructed in the area was the Kansas City Southern, which went due south out of Kansas City and maintained this general direction through the Ozark Plateau of southwest Missouri, northwest Arkansas and northeast Oklahoma, until reaching the small railhead of Heavener, Oklahoma. Had the railroad continued south, the several parallel mountain ridges would have required construction of enormous and costly tunnels and bridges. So deep in the forest, the engineers plotted a court east between Winding Stair and Black Fork Mountains. 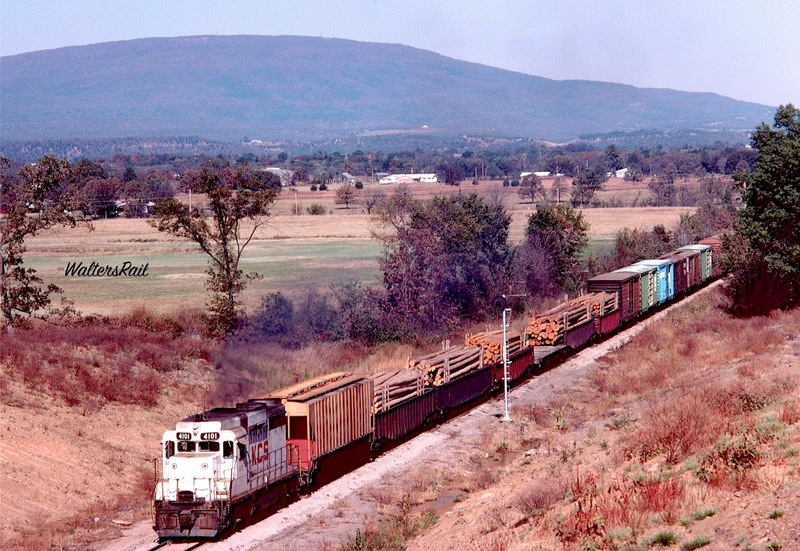 Here the railroad crossed Rich Mountain summit, though the tracks were in the valley, continued east toward Mena, Arkansas, then turned south again through a gap toward Louisiana. Rich Mountain takes its name from the Queen Wilhelmina Lodge, a resort financed by the Dutch monarch. 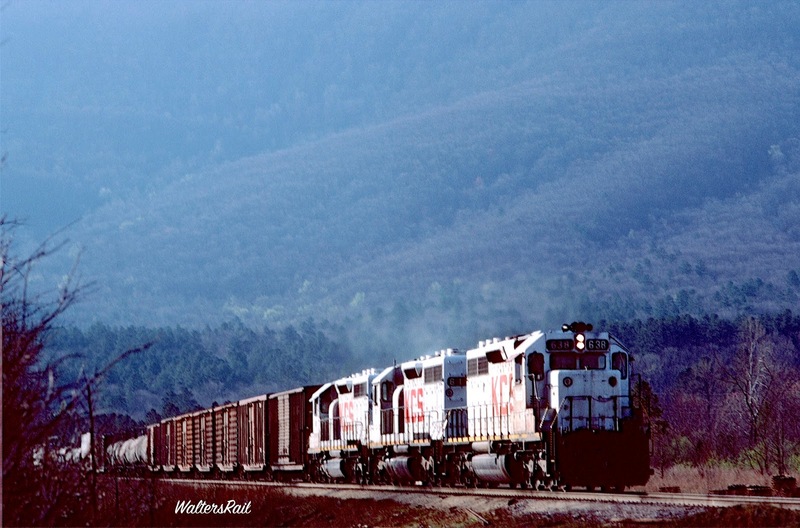 Around 1900, the Dutch invested heavily in the infant line, and in gratitude the railroad named several new towns after locations in Holland – such as Amsterdam, Missouri; Vandervort, Arkansas (a siding south of Mena) and DeQueen, Arkansas (an American version of DeGoeijen). The hotel, built on top of Winding Stair Mountain, was accessible only by logging roads and was never popular. When it burned, no one bothered to rebuild it until Oklahoma and Arkansas paved the road from Mena, Arkansas, to Talihina Oklahoma, across the long east-to-west spine of Winding Stair Mountain. Then Arkansas rebuilt the lodge, now a beautiful place to stay, with panoramic views of the valleys below, though you cannot see the tracks because of the heavy forest. In the early 1970’s, Congress passed a law requiring coal-burning electric plants to use low-sulphur coal from places like Wyoming and Colorado. Suddenly, railroads were filled with unit coal trains running over track that could barely support a local freight. The KCS was no exception. 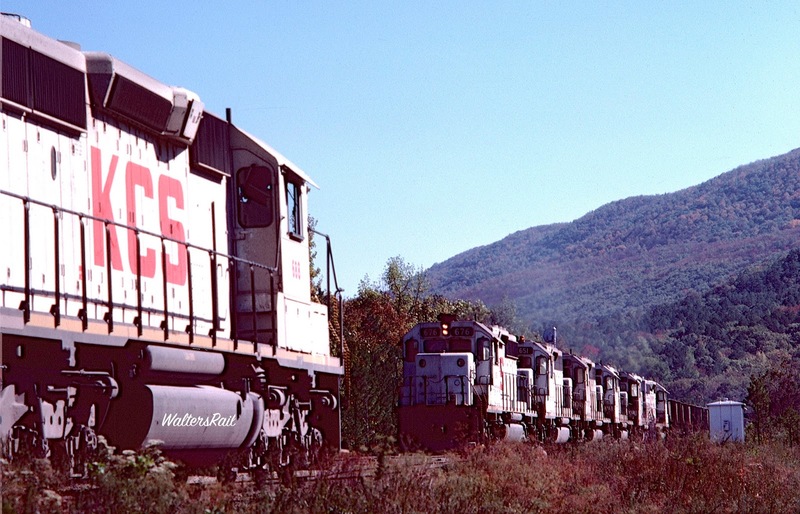 The first coal trains through the mountains were incongruous – shiny white locomotives pulling new coal cars across decrepit track. 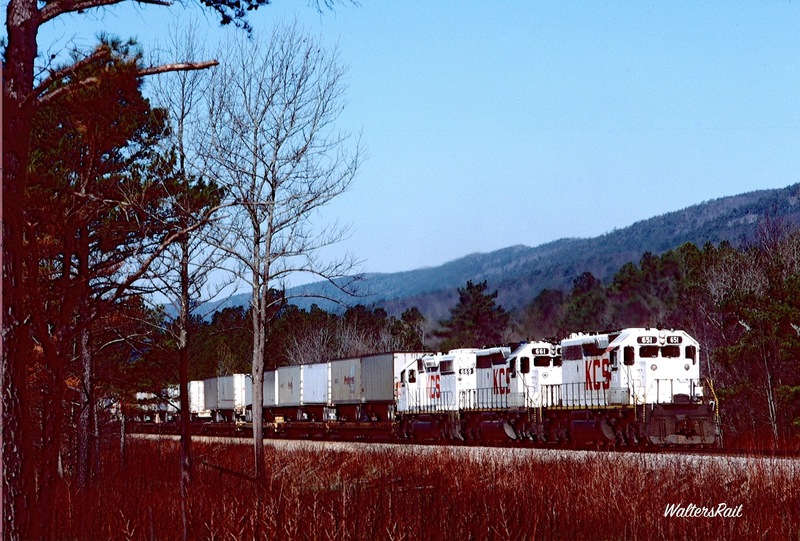 Loaded trains crept south to generating plants in Texas and Louisiana; empty trains crept north – back to the mines. Rail joints squealed. Because many of the passing sidings had been pulled up, there was no place to put all the trains. So one by one, KCS rebuilt the sidings, placed new ballast, installed new ties and laid new welded rail. 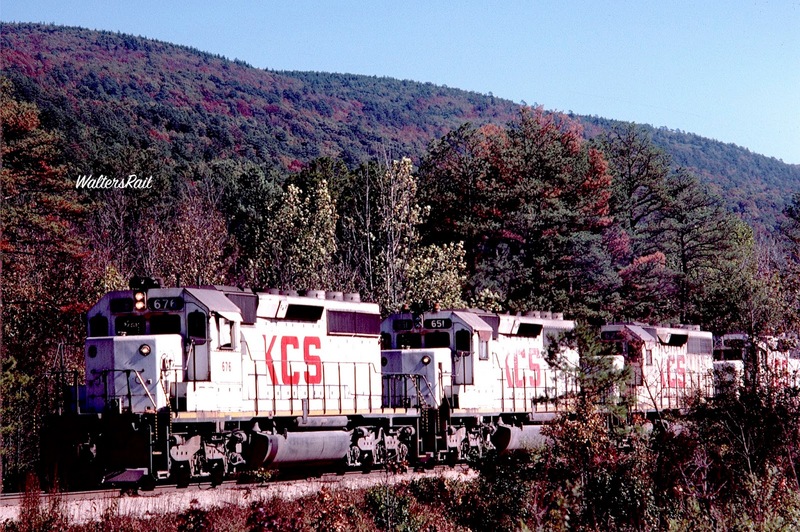 Someone who had photographed the KCS in the early 1970’s but had not seen it again until the 1980’s would not have recognized the railroad. 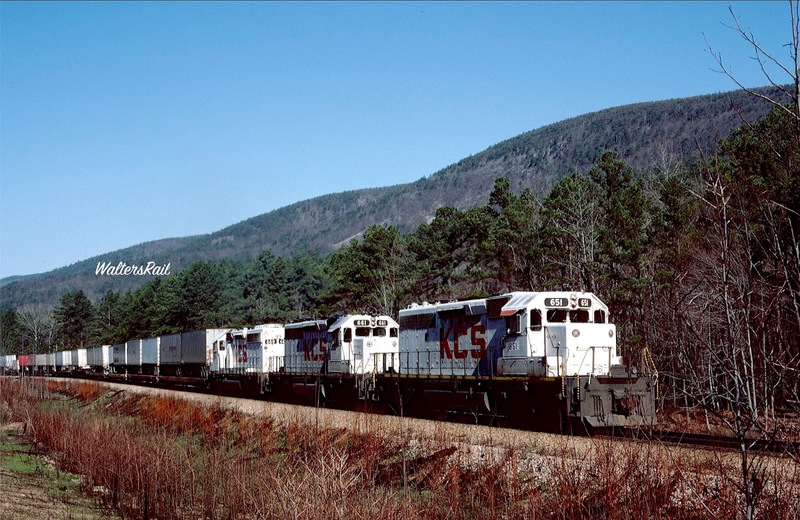 Here is Rich Mountain after the KCS re-installed the passing siding. Although welded rail has not yet been laid, more new ties have been added, as well as substantial additional ballast. Coal revenue is now flowing into the company, and the railroad is slowly clawing back from near-death. 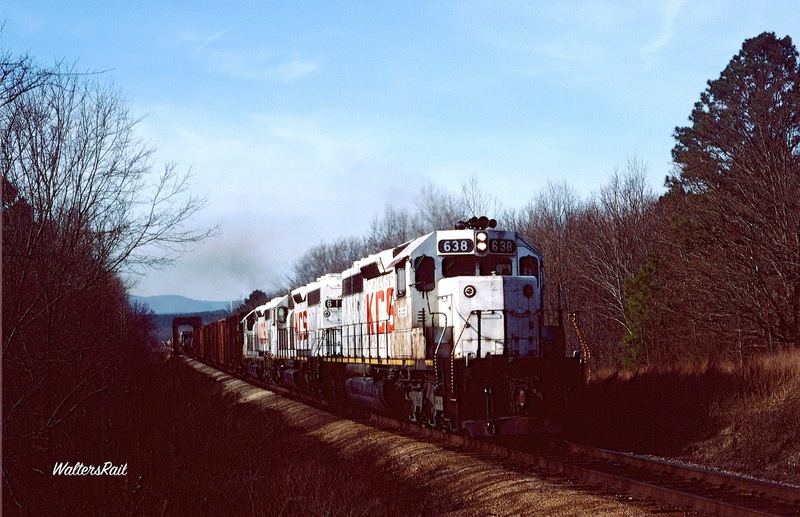 Here is another southbound, loaded, coal drag at Rich Mountain. 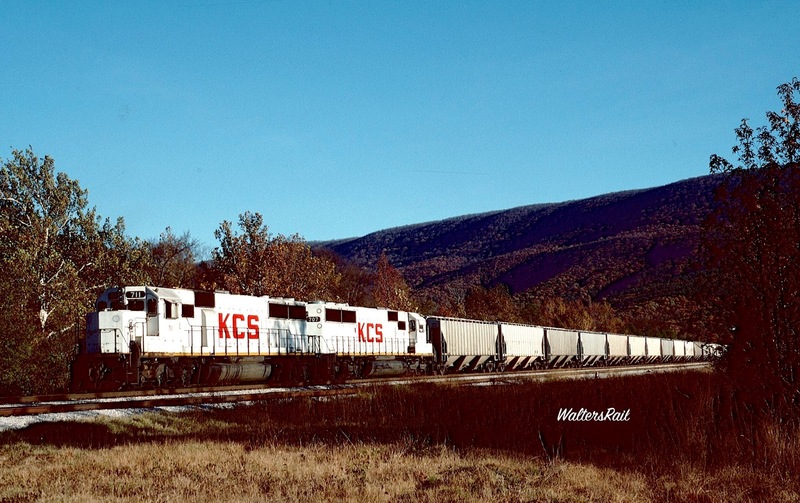 The KCS has now improved both the mainline and passing siding enormously. Even more improvements would follow in short order. This location is still available for photography and sees frequent meets, since it is only one of two passing sidings in the mountains. The other is Page. But even as new life was breathed into the railroad, some old ways were dying. The most notable characteristic of this area is the density of its foliage. A circus maintains its headquarters in Hugo, Oklahoma, south of the mountains near the Red River. Hugo is, in fact, home to the largest open-to-the-public elephant herd in North America. Several years ago, one of the elephants escaped, and no one could find it. The story made the national news, because the idea of losing an elephant in Oklahoma, which outsiders always assume to be flat and treeless, fit neatly in the “dumb Okie” stereotype. Eventually, the elephant was discovered in the forest and returned to the herd. But the reason an elephant could disappear is because trees grow so fast and so thick in this part of the world. 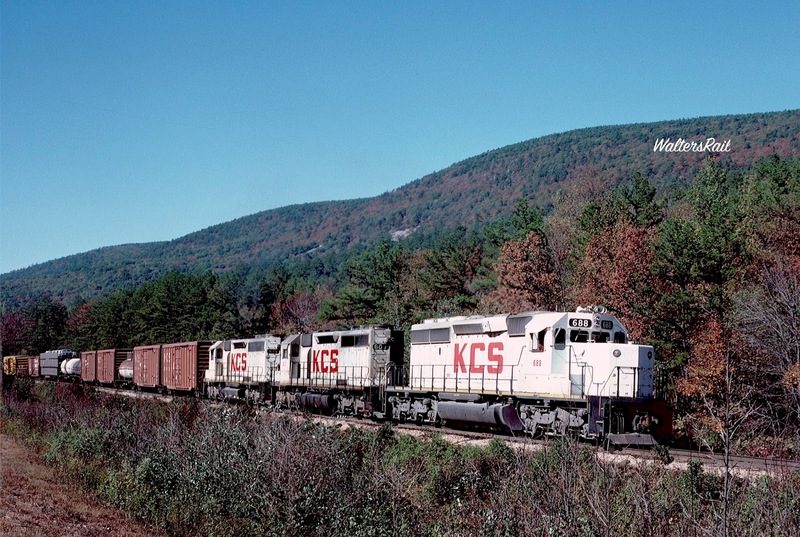 Thus, the KCS’s installation of radio towers to communicate with trains and maintenance crews began a process that in the 21st century has led to the elimination of most of the photographic locations at Rich Mountain. Radio communication, along with technology that allows railroads to control signaling through the rails, made telephone lines obsolete. Eventually, the Kansas City Southern began cutting down the poles and discovered that there was no longer any need to keep the rights-of-ways clear. Ever so rapidly, the forest began to encroach upon the tracks. Today, most of the line to Rich Mountain is encased in trees. I do not mean to imply that there are no longer any decent images from Heavener to Mena. On the contrary, this is still one of the most scenic railfan areas in North America. But the types of photographs have changed. As the above image shows, for a number of shots, it is now necessary to climb though the trees and shoot down the "tunnel," with the mountain in the background. 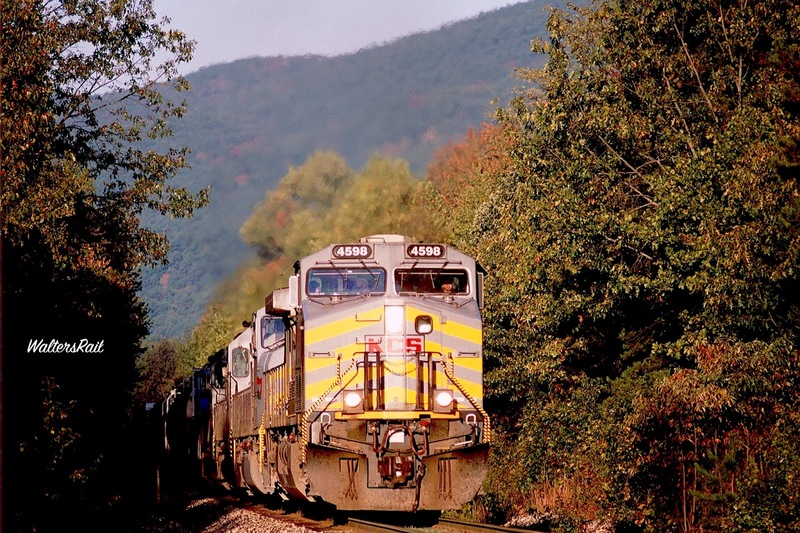 In the 21st century, railroad photography at Rich Mountain is more challenging, and in many way more rewarding. My favorite location in the mountains is Page, Oklahoma. I named my only son after this town, which today is little more than a passing siding, a small Baptist church and a cemetery. 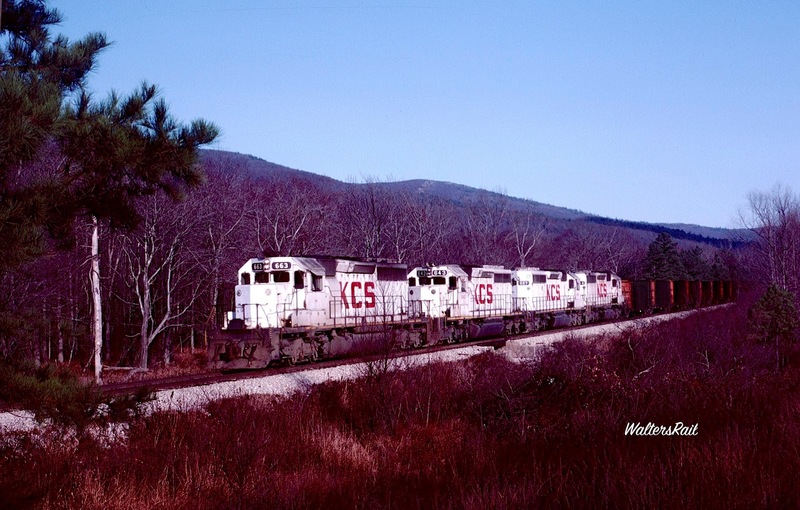 But the KCS keeps the area around the passing siding clear of trees and brush, and the images one can take today are virtually identical to those available in the sixties and seventies. The following images were taken from 1975 to 1986. 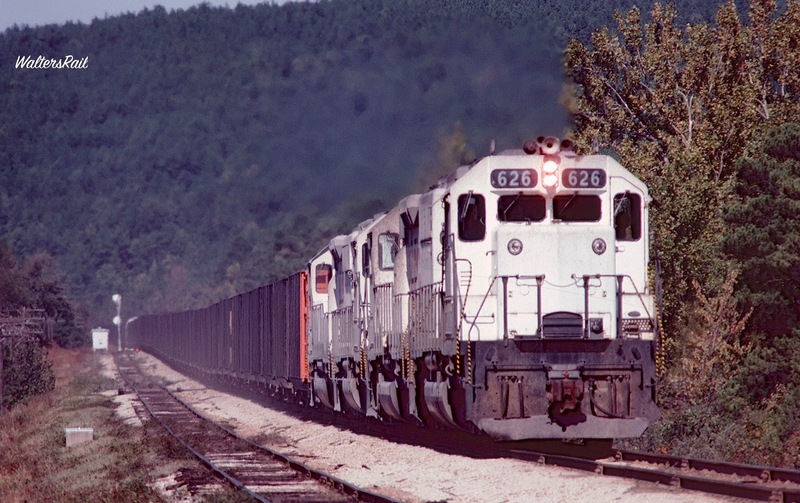 In this image, two coal trains are meeting at Page in 1983. 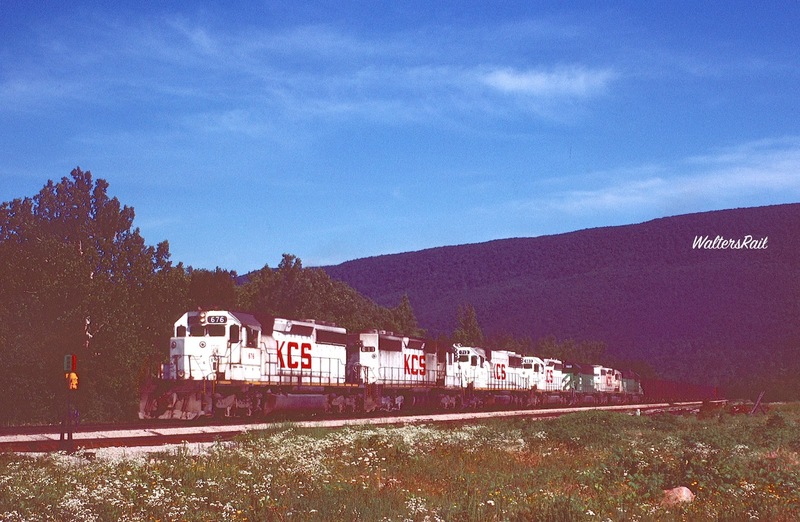 In the early 21st century, the KCS extended the Page passing siding, creating new photo locations. Unfortunately, the above image is no longer available, because the signals have been moved about 800 yards east. This is a northbound, empty coal train at Page. Other images of this same train can be found in this post. In fact, several trains show up multiple times. 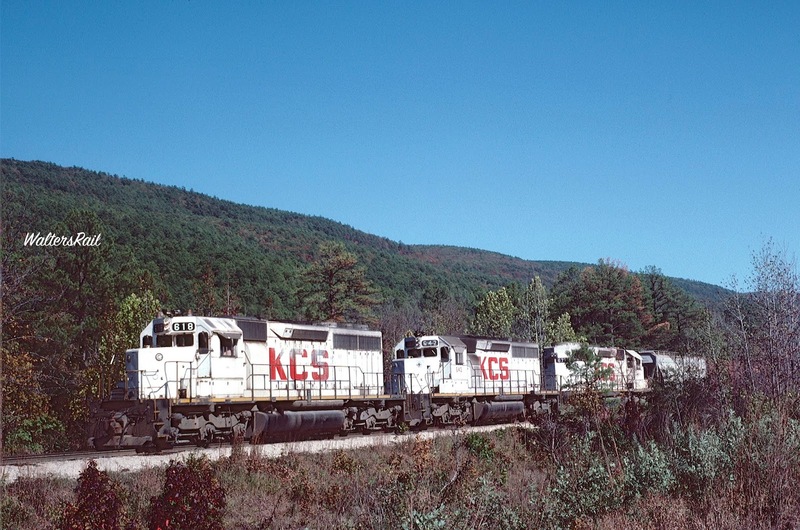 This is because chasing a train through the mountains is great sport and also necessary, since the KCS has never seen a large number of trains. In my limited experience, 10-12 trains per 24 hours is heavy traffic. Several times I have seen far less. Here is a northbound grainer. Winding Stair Mountain towers above. The Talimena Skyline Drive (from Talihina, Oklahoma, to Mena, Arkansas) runs along the crest of the ridge. 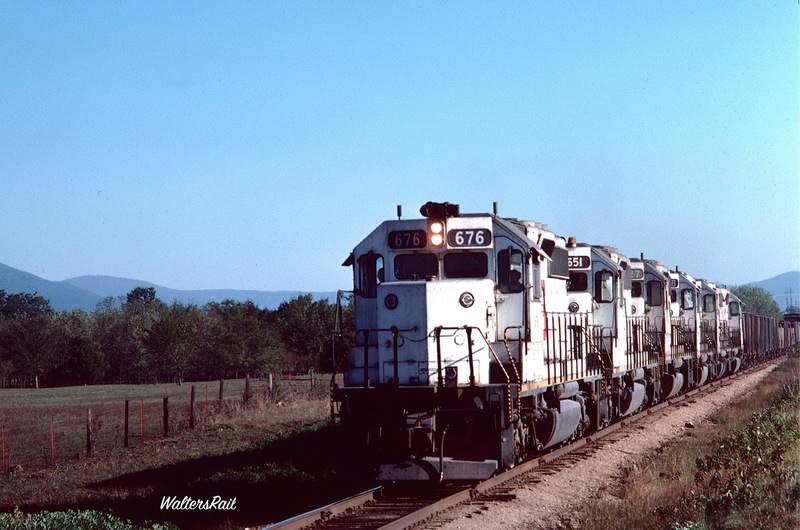 Beneath the silent gaze of Winding Stair Mountain, a northbound manifest waits at dawn on the siding at Page, Oklahoma. For years, I believed that Page was little more than a passing siding. But in my job as a lawyer, I take depositions from time to time. One day (in the late 1980's), I was questioning an elderly woman. I started as I always do, asking her name, date and place of birth. "Really?" I think I said, which did not sound too lawyerly. She said she had been born there, but that the house she lived in, and virtually every other place she remembered was now gone. "There's no town left," she said. "But there's still the railroad," I said. "I remember the railroad," she said. "It kept everyone awake at night." So at least some things don't change. 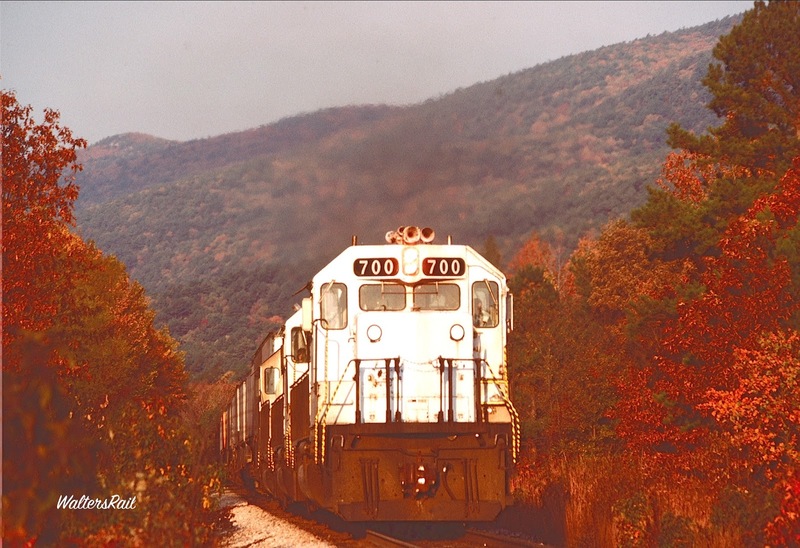 While foliage rapidly overwhelmed the right-of-way, the railroad also began replacing the White Knights with more sedate grey units. (At least they seemed more sedate to me. Others disagreed.) 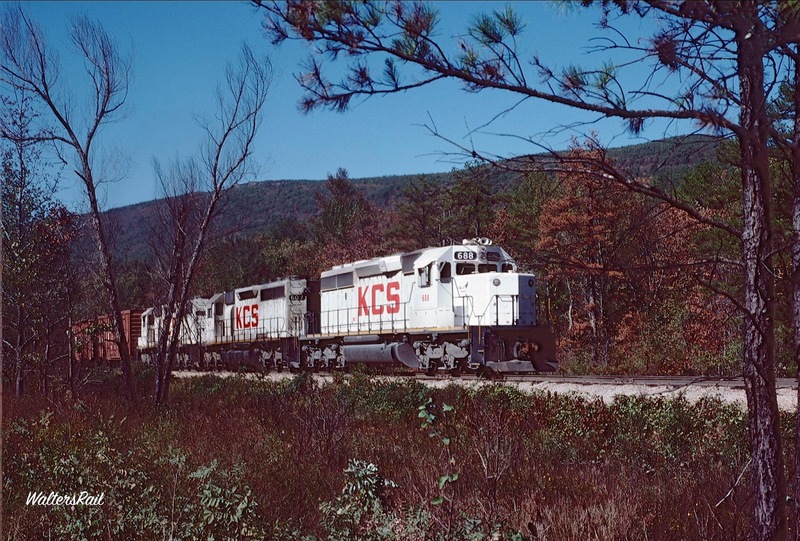 The Knights could be found on trains through the end of the 20th century but today (2016) finding a white KCS unit is rare. 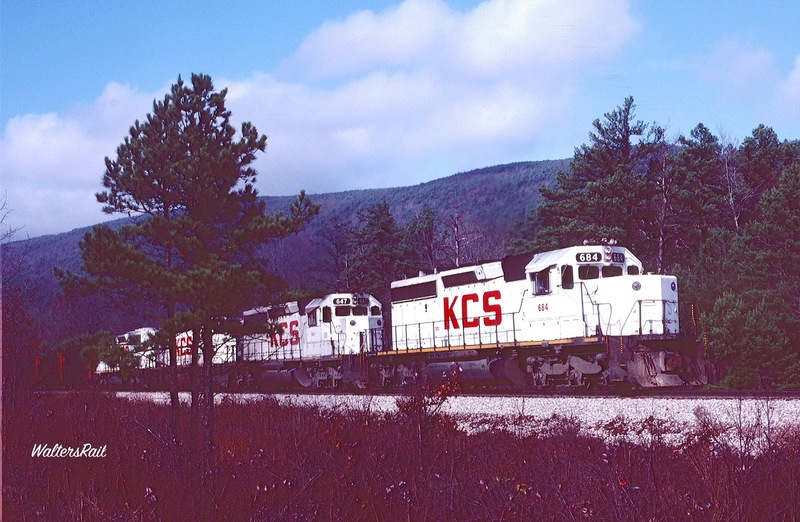 The grey units are now being replaced with “Retro-Belles” that are perhaps as beautiful a paint scheme as the KCS has ever seen. But some of us miss the White Knights – and the locations where we photographed them. So I say good-by to these two old friends: White Knights and telephone poles. I knew you in your prime. KCS has recently cut all the brush around Rich Mountain to several miles north. I mean, there's not a twig remaining between the highway and the tracks in some places. There are vistas now that I have never seen before! I have been shooting pictures there since the '70's like you have. I don't know what's up with this - seems like they might be going to extend a siding or something. I've heard similar reports from others. Do you know how far north of Rich Mountain the trees have been cleared?